The topic non-contact ENERGY- AND DATA TRANSMISSION is not an abstract question of the future anymore and affects increasingly the public awareness. Power transmission by induction, for instance, is an important part of charging electric vehicles. This charging- and data transmission-technology becomes also more and more important in many other applications like in industry, medical technology or consumer electronics. BLINZINGER will support you on this road from the idea to serial production. We develop and manufacture ready-made systems for inductive ENERGY- AND DATA TRANSMISSION. In this context we elaborate innovative and efficient solutions, which are perfectly adapted for individual requirements and most diverse applications. 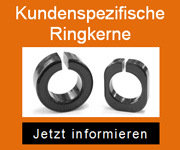 The components, developed and manufactured by BLINZINGER Elektronik GmbH, fulfill highest demands on function and lifespan due to their ruggedness and reliability even under extreme conditions. Use the possibilities of this trendsetting technology and get in contact with us.